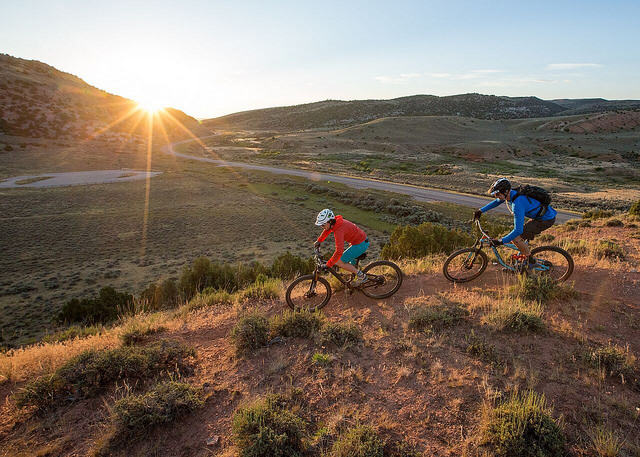 Last week Interior Secretary Zinke announced a 20-year mineral withdrawal for the Johnny Behind the Rocks Recreation Zone area near Lander, Wyoming. Earlier this year, Secretary Zinke also announced an extension of the mineral withdrawal in the Whiskey Mountain Bighorn Sheep Range. Johnny Behind the Rocks is an extremely popular trail system in Lander that was developed through a strong partnership between the local Bureau of Land Management (BLM) field office, user groups such as the International Mountain Bicycling Association (IMBA), and the local community. The withdrawal takes 4,820.75 acres of public land from location and entry under U.S. mining laws, but not from leasing under the mineral leasing laws. In 2016, the local BLM gathered public input on the potential withdrawal, which garnered huge public support. The Johnny Behind the Rocks trails, which are designated one of the BLM’s “Backyard to Backcountry Treasures,” began as a network of cow paths. The local community, including mountain bikers, came to the BLM with a desire to have the trails expanded and maintained. From there, the partnership between land managers and the community has flourished, resulting in a robust recreation asset. The mineral withdrawal echoes the recent Secretarial Order 3366, which directs the Department of the Interior (DOI) to develop or expand recreation opportunities, streamline permitting processes, and improve contracting processes for concessioners. It also requires Interior Department bureaus to have one full-time employee to make recommendations to Secretary Zinke regarding how to develop new, or increase and expand existing recreational activities.